The next generation of Samsung’s flagship phone, the Galaxy S5, may feature more gesture based features, including head tracking controls according to a new patent filing. The current generation Galaxy S4 offers gesture based features such as Smart Stay and Smart Pause – various mechanisms which detect if you’re looking at the screen – but the Samsung Galaxy S5 may feature even more advanced gesture controls. 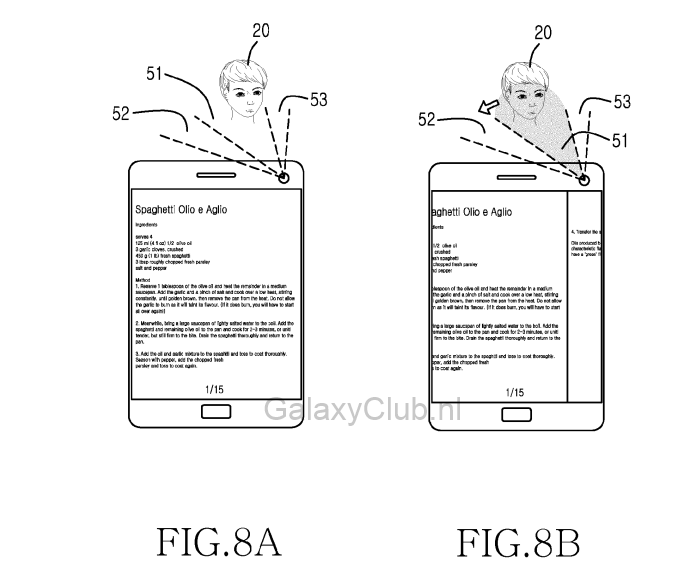 The new patent listing filed by Samsung describes technology whereby a device will detect an action such as a nod of the head or a wink and then carry out a particular function based on that action. For example, a webpage would go back to the previously viewed page if a nod of the head to the left is detected. The patent describing the gestures such as winking and nodding was filed back in July last year, which means that Samsung would have had enough time to incorporate the new technology into their new Galaxy S5 – rumoured to be being released towards the middle of 2014. The detection of a users head and the determination of which way their head moves would be achieved and interpreted by dividing the image received by the camera into various sections. That detection would then be observed and analysed for the change in a particular section to carry out a specific function. The current Smart Stay and over gesture-based controls on the Samsung S4 are very clever, but are somewhat of a novelty and in the real-world use case don’t work that well, and are very rarely used. Could it be that the Samsung Galaxy S5 and the proposed enhanced head tracking be just another novelty Samsung software enhancement? Let us know in the comments section below.